With so many affordable, high-quality options around, there’s never been a better time to go wireless. We check out Sony’s latest offering. 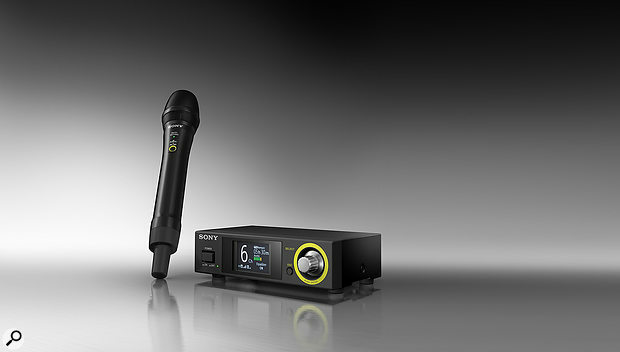 Sony’s DWZ M50 wireless mic package works in the licence-free 2.4GHz band (RF operating frequency range is 2402.0 to 2478.5 MHz) and can support up to six channels. The range is typical of what you might expect from a decent Wi-Fi router, while the audio quality is 24-bit linear PCM, so there’s no need for any compansion or gating, and all the side effects those processes bring. Some users worry about the inherent delays in digital systems but, using normal stage monitors, I couldn’t perceive any delay at all. However, it may be an issue for those using in-ear monitors, where even a millisecond or so of delay can cause problems. Specifically, this package comprises the ZRX HR50 receiver and the TX M01 hand-held wireless microphone. At the reception end, the half-rack ZRX HR50 is a true-diversity receiver with two separate antennae that attach via the usual swivel BNC connectors. Power comes from an included 12V mains adaptor, and in addition to the expected balanced XLR output, which can be switched between mic and line level, there’s also a quarter-inch jack version of the main output, plus a tuner/aux output jack that can be set not to be muted along with the main output if required. A mini USB socket allows for firmware updates, and there’s an optional rackmount kit available. A small colour display on the front panel gives access to operational status and the user-adjustable parameters, which include a five-band graphic equaliser. All data access and editing is accomplished via the turn-and-push data encoder located at the right-hand side of the panel. The only other front-panel controls are the on/off switch and an escape button. The remaining transmitter battery time is also displayed along with RF signal strength. Hidden within the mic/transmitter are the display and controls for selecting the channel, as well as a Lock switch.The microphone has the option of interchangeable heads and is powered by two AA alkaline batteries, giving around 10 hours of operation. As supplied it has a moving-coil cardioid-pattern head with a 70Hz to 16kHz frequency response, and level handling of up to 142dB SPL with the 12dB pad switched in. The mic body is slightly fatter than many hand-held mics (around 30mm), because of the need to house the batteries, but a suitable mic clip is supplied with the kit. Externally, there’s a power/mute button and status LED that indicates both battery and mute status, but unscrewing the body cover reveals the battery compartment, the channel selection readout and its associated mini-button, plus a Lock switch. Optional 6 and 12 dB attenuator settings are accessed by unscrewing the microphone head. The RF section has both wide and narrow modes. In Wide Band RF mode, any of the six channels may be selected and the system offers a useful degree of in-built resistance to interference from other wireless devices. Initiating Best Channel from the menu automatically finds the one with least interference risks. Narrow Band RF mode again offers six channels (this time lettered rather than numbered), and Sony’s clear-channel scan function automatically picks the best frequency to minimise the risk of interference. A white channel number with an underline indicates low interference; grey fonts indicate high levels of interference, and in the eventuality that no clear frequencies are free, there will be a No Usable Channels display. Whichever mode you select, the channel number (or letter A to F in Narrow mode) on the transmitter and receiver must be set the same. Wide and narrow modes should not be mixed. Changing RF modes on the transmitter involves powering up while holding down the Channel button. The receiver RF mode is set using the display and data wheel via the Advanced Settings menu. Using this system is almost as simple as plug and play. Setting up is easy, the sound quality rivals that of a length of cable, and the microphone has a well-balanced sound combining full-bodied lows with good definition in the important 3 to 6 kHz presence region. I had no interference issues in either RF mode, despite my home router and laptop being nearby when conducting indoor tests. Under real ‘battle’ conditions the range will vary depending on the physical environment and the proximity of potential sources of interference, but in most gig situations the signal only has to make it from the mic to a nearby stage box, so placing the receiver reasonably close to the mic should not be a problem. Having a diversity receiver also lessens the risk of RF dropout caused by reflections from nearby objects being in anti-phase with the direct signal, as the system always switches to the antenna receiving the strongest signal. While a 2.4GHz system might not be the right solution for a West End musical, being able to use up to six systems on six different channels at the same time is often more than enough for a gigging band where the vocalists and guitar players are generally the only ones who feel the need to go wireless. Having no license fee to pay is also a bonus. The price is sensible given the quality, though I’d have been happier if the kit came in a plastic case rather than a cardboard box, especially as my attempts to get all the packaging back into the box have, so far, been futile! Many of the major microphone companies now offer 2.4GHz wireless systems, but check out Line 6 as they were one of the first companies to climb into the 2.4GHz arena, and I’ve always been impressed by the performance of their systems. This wireless system retains hard-wired sound quality and is a good option for those needing relatively few channels and a modest range — typically up to 50 feet.